Further define the area as an "outdoor room." These awning valances are easily and quickly connected to the overhead track system as shown below. Simply measure all sides you'd like trimmed with a valance and indicate your fabric choice and measurements on the order form. We'll add a binding to the edges and rivet them to the snap-in valance strip for years of durability. Sold per linear foot. May also be imprinted with a company logo. See your dealer for a price quotation and details. Note: When using a valance on the outside front (perpendicular to the tracks) the valance can be attached to the wood, using eye hooks and grommets. When ordering valances to be used on wood, please specify which length you would like grommeted. It's a "snap"... literally! 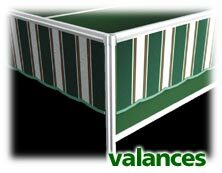 The valance fabric slides into a white trim molding which quickly snaps into the outside of the tracks. Easily removed for seasonal storage.